Let’s say you purchased the cutting machine to cut firewood for the cold winter months- logging would be your primary task when using your saw.As such, it’s highly advisable to buy a decent quality sawhorse that will hold your timber in place while it’s being logged. Before you initiate any work, consider your workplace; figure out the best spot to set yourself and your tools.Ideally, a clear, level space- with around 5 meters of clearance in every direction- will work best. Also, remember to tell others of your workplace and what you’re doing. It is essential that you thoroughly and carefully through the direction manual that comes with your cutting tool. A few chainsaw manufacturers provide you with a video or DVD explaining important safety measures to take. Watch it too. Place the new chainsaw on a table or bench before you, and familiarize yourself with each and every control it comes with. At the base of your saw, there exists a little metal bar that runs under the chain and is known as the chain catcher. It is there to successfully grab the chain in case it derails or breaks. A stop control button or simply a lever is set at the back of the saw, within the scope of your thumb to let you rapidly halt the saw engine when necessary. Along the bottom part of the back handle, you will see a wide, level guard. This is intended to secure your right hand in case the chain breaks or wrecks. It is likewise utilized when starting the cutting tool, allowing you to put your foot on the guard while pulling recoil rope to turn the engine over. Another quite crucial safety feature on your saw is the chain brake. This is a lever situated before the top handle and can be enacted manually, or by pushing it forward, or by the inertial forces arising from dangerous kickback experienced when the top-half your chainsaw bar nose unexpectedly gets into contact with something, constraining the machine upwards/backward. Chainsaw safety clothing is crucial in ensuring you’re completely safe should a mishap occur. Ideally, you need to wear the right safety gear right from the top to the toe. But this is not always viable or might not be within your budget. In any event, do ensure that you’re in clothing made from heavy, sturdy material. Additionally, put on a sturdy pair of boots with durable toe cap. Gloves ought to be thick (but not thick enough to prevent your fingers from moving your fingers from effectively controlling your saw or pressing the critical safety controls. On top of all this, ensure you buy a chainsaw safety helmet. Facial injuries from this cutting tool are consistent and the most severe. The helmet will help prevent such fatal accidents at all times. They’re fitted with face guard plus ear defenders and are incredibly cheap. Purchase one! Since you’re acquainted with your cutting machine and have the perfect safety gear, it’s time to put it to work!Before you do, check your chain. In the case of a new saw, the chain will feel sharp but will tend to stretch and loosen after some use. This means that you need to familiarize yourself with the chain-tensioning tool on your specific saw; learn how to how to utilize it to bring the chain back to normal. Besides, chain sharpness is also of great importance. You should again learn how to utilize the saw sharpener or a file to keep your chain in a peak state! 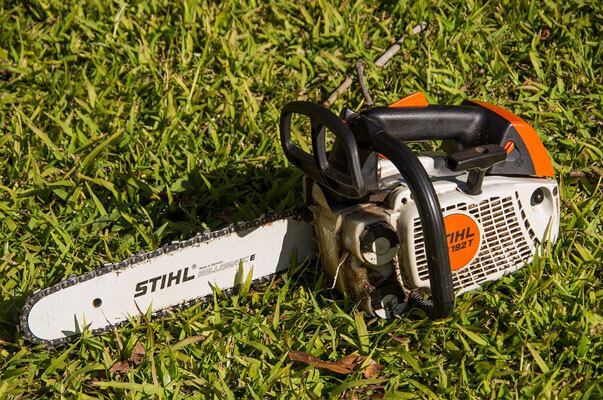 Follow the manufacturer’s fuel-blending guide if utilizing a petrol machine; take care not to overfill your saw. Read through the user manual and strictly follow the start-up directions for your particular model of cutting device. Don’t forget to confirm whether the safety brake is working correctly (do this by squeezing throttle and applying your brake simultaneously- this should stop the chain promptly). Test your chain lubrication by simply holding the saw bar over a light-colored surface (like a newspaper). Run the saw to see if you’ll get a thin trail of lubricating oil. If you’ve never used this machine before, we’d advise you to get some practice in. Begin off by cutting small logs before you advance to the bigger stuff (and keep in mind that this can be tiring work). Don’t attempt to do all at once; instead, begin with little blasts and, step-by-step, increment your working durations. Hold the saw solidly on its handles and don't be hesitant to keep it near your body. This will give you a better balance when operating it. What’s more, your back will be less strained. If you want to learn how to operate your new chainsaw effectively, this beginner’s guide will help you out. It will help you get fully acquainted your saw, after which you’ll be able to use it on different activities around your home such as tree pruning, construction, logging, etc. With time, you’ll realize how simple the whole thing turns out to be. You’ll even enjoy using the cutting machine where necessary.